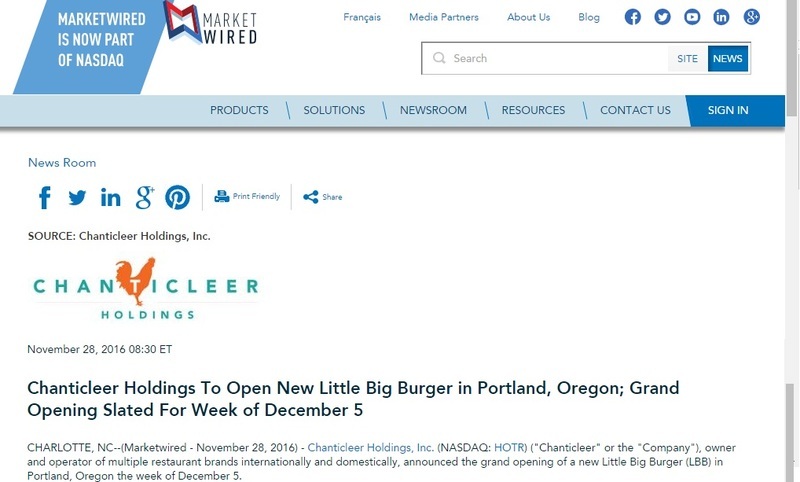 Chanticleer Holdings, Inc. (NASDAQ: HOTR) ("Chanticleer" or the "Company"), owner and operator of multiple restaurant brands internationally and domestically, announced the grand opening of a new Little Big Burger (LBB) in Portland, Oregon the week of December 5. This will be Chanticleer's ninth Little Big Burger and 40th fast casual better burger store. Fast casual better burger restaurants now account for 70% of Chanticleer's total store count. The restaurant will be located in the Lloyd District at the Hassalo on Eighth Velomore Building: 1088 NE 7th Ave. in Portland. Portland is the largest city in Oregon, with 60% of the state's population residing within the city's metropolitan area.